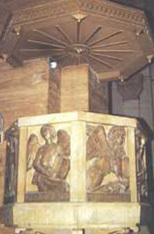 The pulpit of the cathedral is found at the right side of the main altar area. Since the pulpit is a stand at which God’s word is translated and expounded, the authors of the New Testament Gospels – Matthew, Mark, Luke, and John – are portrayed here in different panels. Bronze reliefs of the four evangelists by Luigi Scirocchi find their way in the pulpit: Matthew as an angel, Mark as a lion, Luke as a bull, and John as an eagle.